The above picture was taken this morning (Tuesday) at Ladybank Golf Club, Fife and features Connor Syme donating his Walker Cup bag and some memorabilia to Ladybank club captain, Brian McSkimming. The bag etc will go on display in the clubhouse. 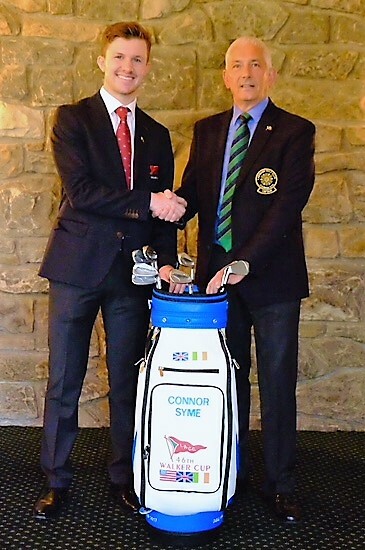 Connor was awarded honorary membership of the golf club last year in recognition of his achievements in amateur golf. Although brought up in Dumfries, where his dad was the golf pro at Dumfries and County GC, Ladybank is the club where three generations of the Syme family are members. Connor's father and a couple of uncles are previous club champions. Connor has been a member there for about 12 years. Connor plays out of Drumoig as that is the base for Stuart’s golf teaching facility but Ladybank is the family's spiritual golf home. He’s off this week to prepare for his next pro tournament in Dubai, starting January 25.